Self-taught Bloemfontein designer, Philip Nel, incorporates thoughtful aesthetics and functionality into every part of his life. His latest brilliant invention, the Inizio home, allows buyers the chance to step into his world – one of immaculately planned an executed design. 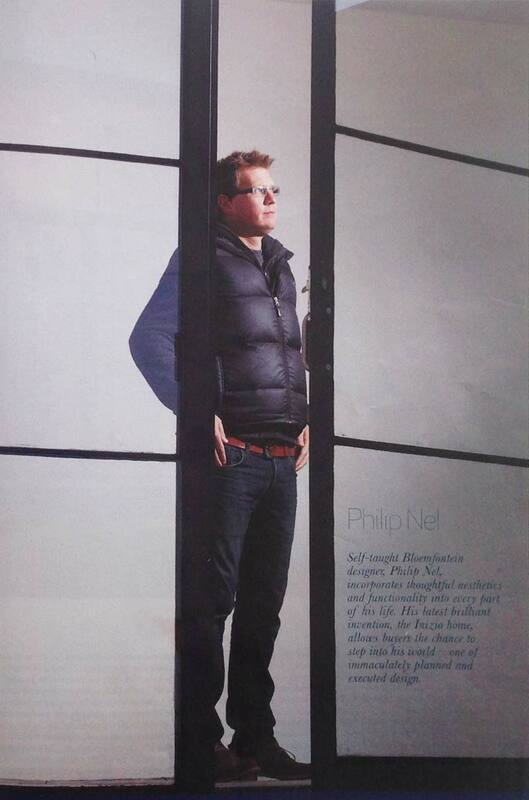 From his work with fibre glass to his furniture creations under the Inizio label and design work on bicycle frames, packaging and carbon-fibre wheelchairs, Philip Nel's portfolio is an ever-expanding entity. His modular Inizio houses are the latest addition to the portfolio, with an expandable quality all of their own. 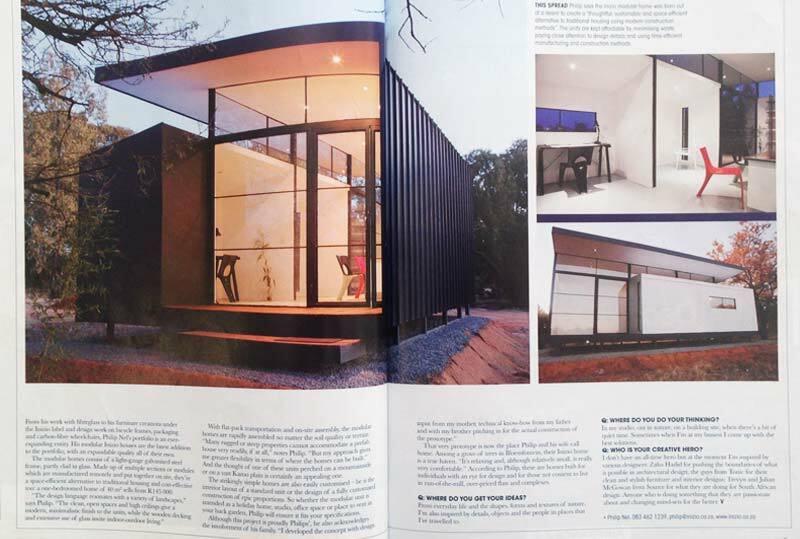 The modular homes consist of a light-gauge galvanised steel frame, partly clad in glass. Made up of multiple sections or modules which are manufactured remotely and put together on site, they're a space-efficient alternative to traditional housing and cost-effective too; a one-bedroomed home of 40m2 sells from R145 000. “The design language resonates with a variety of landscapes,” says Philip. “The clean, open spaces and high ceilings give a modern, minimalistic finish to the units, while the wooden decking and extensive use of glass invite indoor-outdoor living”. With flat-pack transportation and on-site assembly, the modular homes are rapidly assembled no matter the soil quality or terrain. “many rugged or steep properties cannot accommodate a prefab house very readily, if at all,” note Philip. “But my approach gives me greater flexibility in terms of where the homes can be built.” And the thought of one of these units perched on a mountainside or on a vast Karoo plain is certainly an appealing one. The strikingly simple homes are also easily customised – be it the interior layout of a standard unit or the design of a fully customised construction of epic proportions. So whether the modular unit is intended as a holiday home, studio, office space or place to rent in your back garden, Philip will ensure it fits your specifications. That very prototype is now the place Philip and his wife call home. Among a grove of trees in Bloemfontein, their Inizio home is a true haven. “It's relaxing and, although relatively small, is rally very comfortable.” According to Philip, these are homes built for individuals with an eye for design and for those not content to live in run-of-the-mill, over-priced flats and complexes. Q: Where do you get your ideas? From everyday life and the shapes, forms and textures of nature. I'm also inspired by details, objects and the people in places that I've traveled to. Q: Who is your creative hero? I don't have an all-time hero but at the moment I'm inspired by various designers: Zaha Hadid for pushing the boundaries of what is possible in architectural design; the guys from Tonic for their clean and stylish furniture and interior designs; Trevyn and Julian McGowan from Source for what the are doing for South African design. Anyone who is doing something that they are passionate about and changing mind-sets for the better.